Statesville Website Design is part of McBryde Website Design. Established in 1998, we focus on quality websites at a fair price. We pride ourselves on our ability to provide top quality service no mater the size of your web project. We are a brick and mortar local business. All of our website work is performed in house giving us better control and you that personal touch. We also manage our own servers, they are not some cheap hosting on an overloaded server. 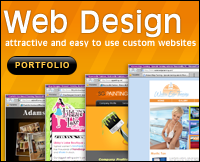 Our experienced team will work closely with you to create your one-of-a-kind web. Our goal is to build the website you want and that will attract new customers for you. Creating custom websites that connect you to new clients is our specialty. Website design is not the only service offered by Statesville Website Design. We are a one stop shop for Domain Name Registration, Hosting and Email Service and more. Fast and reliable hosting services are a huge part of a successful website. Web visitors won’t stay at your website if the pages load slow. With control of our own servers we are able to provide this to you. Do you already have a website? We can host it, and your email. No more tech support overseas, our staff of local professionally trained people are able to take care of most any problem you may encounter. We pride ourselves in our ability to provide our local Statesville businesses with a cost effective online presence. When you call us at 704-660-7052 during normal business hours you will speak directly to one of our team! So call and let us help grow your business. Do you need a new website or an old website updated? Copyright © 2019 Statesville Website Design. Proudly powered by WordPress	& The WP Theme by ceewp.com.